Separated from Meghan by the poisonous Iron realm, Ash embarks on a journey to gain his soul and become mortal so that he can be with her. His quest is one of the utmost difficulty, though. First, he and his companions, which include his nemesis, Puck, must travel to the very end of the Nevernever, a dangerous undertaking in itself. The trials that await Ash at the End of the World, however, are the most daunting challenge he’s ever had to face. To attain mortality, he must confront his past and future, both of which he needs to come to terms with if he hopes to ever see Meghan again. The Iron Fey series has been a bit of a roller coaster ride for me up to this point. Neither The Iron Daughter nor The Iron Queen quite measured up to The Iron King. The constant throughout the books, and what has kept me reading them, is the stellar creativity of this world. I’ve always felt like I’ve wanted to love the characters, but I just haven’t been able to become emotionally invested in them. 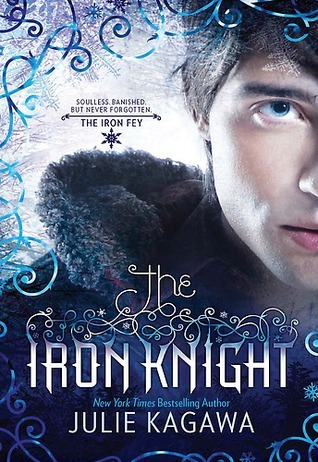 This is especially true for the Winter prince, Ash, who narrates The Iron Knight. He’s intrigued me from the start of the series, yet I don’t feel that I’ve ever gotten a good sense of him as a character, how he thinks and what motivates his actions. I’d hoped that reading from his point of view at last in The Iron Knight would give me the insight into his character that I’d been seeking. While a good portion of the novel follows the task-by-task structure of the previous books, once Ash commenced his trials to earn his soul, I finally connected with the series. Besides the potential to get inside of Ash’s head, I was also eager to read this because one of his traveling companions is none other than Puck, probably the last face Ash wants to see in his party. I’d expected a slightly more standoffish demonstration of the enmity between them other than Puck calling Ash “ice-boy” over and over. The exchanges between a sardonic-as-ever Grimalkin the cat and the Big Bad Wolf were much more amusing. By now I’ve grown accustomed to the characters in these books needing to complete a string of subtasks before tackling their main goal. Ash’s secondary missions feature plenty of action, but to me, they were only a warm-up to the trials that would prove whether or not he was worthy of his soul. It was this part of the book that I found riveting because of its emotional punch, something that was rather elusive for me in the other books. To gain his soul, Ash must pass a group of tests that give him an all too realistic understanding of what it means to be mortal. They’re all grueling, but one struck me in particular. Ash revisits his past misdeeds in excruciating detail, and not only do we see the cruelty that he was once capable of, but also how much he’s changed for the better. I thought that what Ash went through during the trials represented some of the most dramatic and moving moments of the entire series. Their combined impact quite floored me, as did one character’s very poignant sacrifice. Seeing everything that he endured, I wanted Ash to succeed in his quest. I hadn’t felt this compelled to root so hard for a character in this series before. Although I think that The Iron Knight could have explored Ash’s character further, this was easily the book out of the four that tugged the most at my heartstrings. Ash’s trials were so engrossing to read about, and overall, I thought this was a strong conclusion to the series. I wasn’t sure what my final opinion of this was going to be. Ash and his little group had several smaller adventures as they made their way to the End of the World, but while there was enough action afoot, Ash himself remained somewhat of an enigma. I wouldn’t go so far as to describe The Iron Knight as a character study of Ash, but I do think that this is as emotionally raw as I’ve ever seen him. Throughout the series, I've felt so stone-hearted for not being able to gush over the romance. It's just always lacked something for me, but then I tend to be the lone person who got something entirely different out of a book than everyone else did, lol.